1. In a bowl, combine flakes of chicken, Black Diamond Cheddar Cheese, apple, celery, walnuts and mayonnaise. Add salt and pepper to taste. 2. If using smoked chicken, combine all filling ingredients except chicken and lettuce. 3. 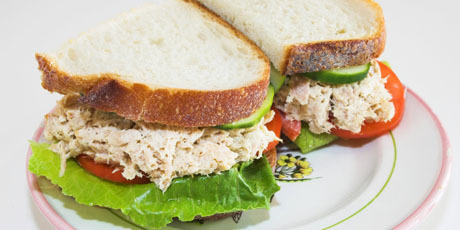 On 2 slices of bread, place lettuce; top with half half of chicken mixture OR slices of smoked chicken, half of apple mixture and remaining 2 slices of bread. Enjoy!